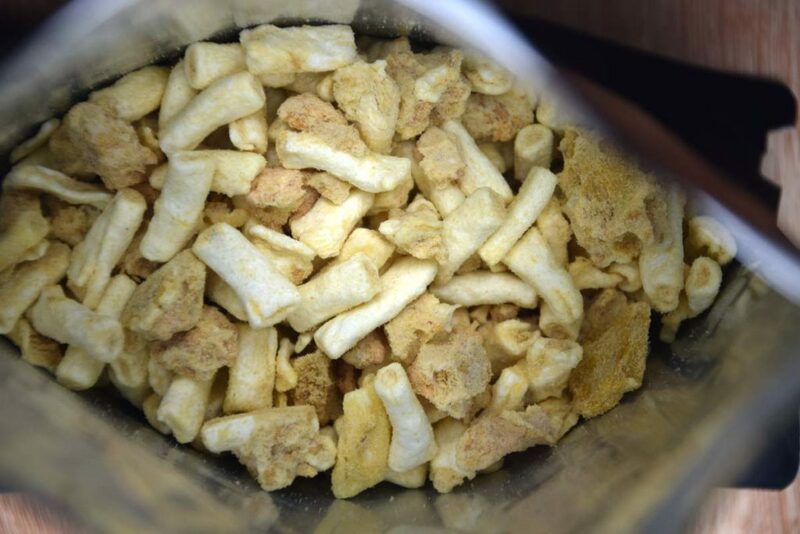 Campers Pantry have been known over the past couple of years as producers of high quality freeze dried vegetables but in late 2017 they became the newest entry into the Australian freeze dried meal market releasing ten main meal options in addition to three dessert choices. These meals are progressively becoming more commonly available and can also be ordered both online, in store and through the supplier. Campers Pantry has done the homework and these main meal offerings which are single serve, sit in the middle, size-wise, of the other two brands at 110 grams. On simple overnight trips, I find that the single serve offerings from Back Country work well but on multi week trips they are just not enough. This larger single serve suits those of us with bigger appetites who don’t want to go with the full twin serve option. In addition these meals offer some great variety rather than trying to duplicate what is already on offer and in doing so, expand the freeze dried meal choices on offer. This includes two vegetarian offerings, that means that everyone should be happy. In working my way through the menu range for the Campers Pantry I’d been saving the Mango Curry Chicken option, having a love for both mango and curry and as such had built my expectations up. I have a love of cooking and curry’s in particular and am never been game enough to have a dinner party and serve curry because I know that many of my friends prefer more neutral food. 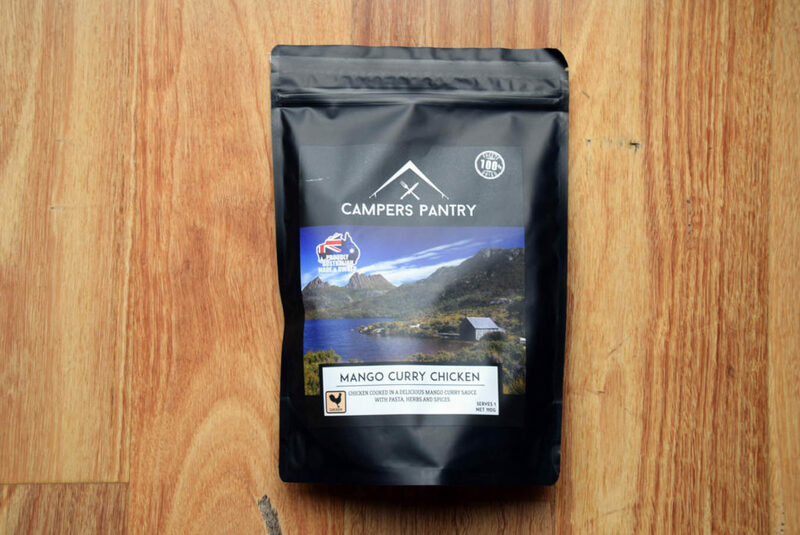 As I write this review this is meal number 4 for me of this campers Pantry range and the choices I’ve sampled so far are on the more neutral side with the Campers Pantry Mango Curry Chicken being no different. From a taste perspective lets cover the negatives first and there really is only one negative, at least for me. While this meal is supposed to be a curry option it can best be described as a mango chicken pasta dish as the curry is non existent having no spice what so ever. The Campers Pantry Balti Vegetable Curry has a good mild curry flavour that this meal is missing. Having said that apart from expecting a curry if I leave that aside the taste of this meal is very good. The chicken tastes like chicken, there is a definite a taste of mango and if you look closely you can recognise mango within the meal. 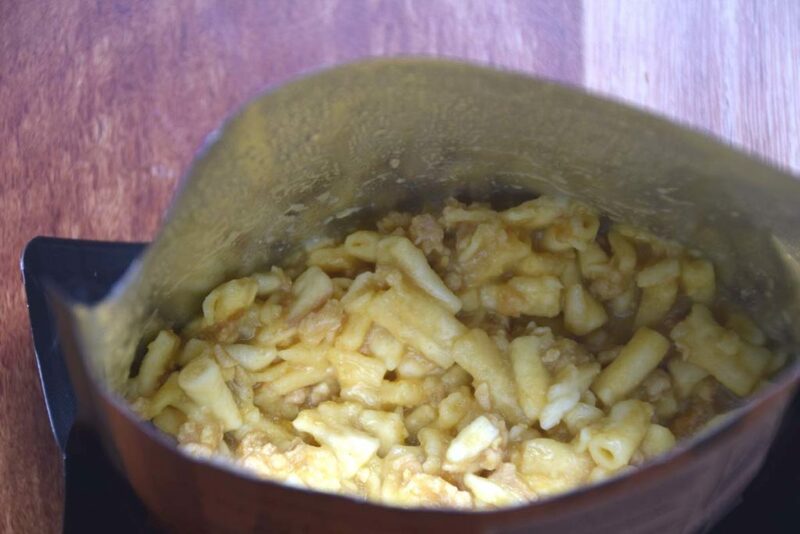 As with the other Campers Pantry Meals the taste was noticeably less artificial than many of the existing meal choices on the Australian market. In addition there also is less salt and as someone who doesn’t add salt to food, I appreciate this. Campers Pantry meals have a higher protein content than the other available brands on the market which is so important particularly over the longer trips. The Mango Curry Chicken 33.2 grams of protein per single serve pack compared to under 16-17 grams per serve from other meals on offer. The calorie content is also high at 509 calories for the single serve pack which as someone that can, and does, burn anywhere up to 8,500 calories in a single day I really appreciate. The Campers Pantry bag recommends adding 250 grams of boiling water to rehydrate this meal but the supplier informed me that when he reprints the bags he will increase this recommendation. I added 300 mls of water as suggested and this produced a good consistency. 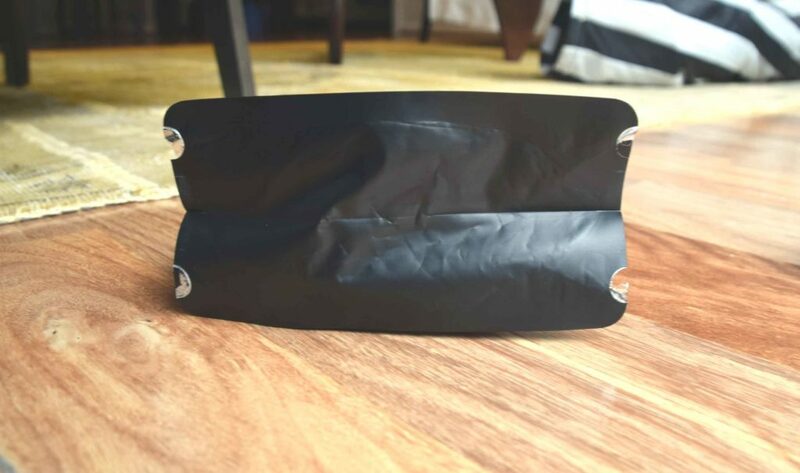 Campers Pantry recommend allowing 20 minutes for rehydration with an occasional stir and partly this is due to the extra protein in the meals requiring this additional time to absorb the water but also because the 10 minutes that the other manufactures recommend is not enough. I’ve been playing with the dehydration times and 14 minutes is more than adequate to allow the water to absorb and to provide a good consistancy. The normal price for these meals sits around the $15.95 mark for a single serve pack which if you compare this to the offerings from Back Country Cuisine single serves is expensive. However, lets talk value for money rather than cost. These meals taste great, have a much higher protein content than the other choices currently available on the market which is very important on the longer more physically demanding trips. They also have a higher calorie content which helps to reduce the food weight you carry. These meals have a two year shelf life so you can stock up at the sales in anticipation of an upcoming trip. The meal comes in a bag that is well designed and the bottom opens out to provide a flat base if you want to leave the bowl at home. Unlike Back County and Outdoor Gourmet, the Campers Pantry meals don’t have a tear point to make the food easier to access. This doesn’t bother me as I prefer to use a long handled spoon and leave the bag intact otherwise you can end up a big mess in your rubbish bag. So what is the final verdict? While not really a curry I liked this meal as it has both good taste and texture so will be adding this meal to my hiking meal rotation for longer trips. While not spicy or for that matter curry, the taste and texture are good. Please note that our affiliations do not influence, in any way, the independence of our gear reviews. If we don’t like a product, you’ll hear about it from us!